Yoshihiro Maru is getting on base more by swinging his bat less. 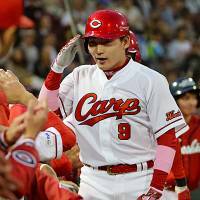 The Hiroshima Carp outfielder is still pretty good at the plate, but after refining his approach the 25-year-old has become a more selective hitter and is beginning to draw more and more walks. It’s something he added to his game last season that so far has carried over into 2014. Maru walked twice during Sunday’s 10-0 drubbing of the Yomiuri Giants and is third in the Central League with 28 walks, six fewer than Tokyo Yakult Swallows slugger Wladimir Balentien, who leads the CL with 34. But Balentien is a 185-cm, 100-kg, walking home-run factory, and big, strong, walking home-run factories tend to be walked on occasion. Maru, on the other hand, has never hit more than 14 home runs in any of his three full seasons and has to work a bit harder to get a free ride to first. For him, it’s about plate discipline and not swinging at pitches in difficult-to-reach spots. More or less, he’s used the same formula that’s helped keep Hanshin Tigers shortstop Takashi Toritani, even less of a power threat than Maru, among the leaders in walks the last several seasons. “I’m patient and I try not to swing at difficult strikes,” Maru said. “I have it in my mind what pitches I want to hit and those I shouldn’t swing at until there are two strikes. Maru drew 92 walks over the course of 251 games from 2010-2012, his first three professional seasons. He then nearly matched that total in 2013 alone, walking 85 times — fourth most in the CL and just one shy of a tie for third place — over the course of 140 games. 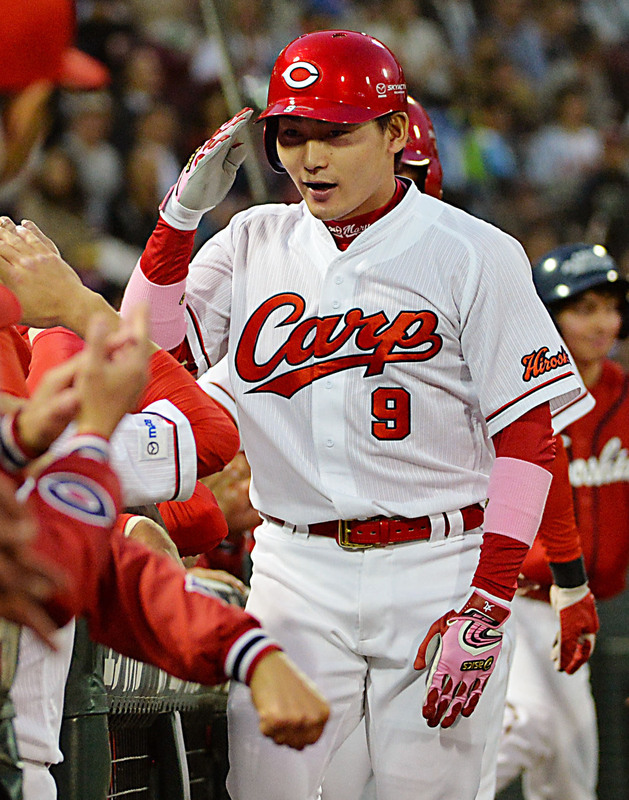 Maru is .299 with a .404 on-base percentage, six home runs and 20 RBIs, so he’s hardly contributing through walks alone, but the fact he’s on base more has given the Carp’s other hitters more chances to make something good happen. Maru can also be an effective base-stealer, he has seven stolen bases, and is a smart baserunner, which makes him that much more dangerous once he’s on base. For his part, Maru says his goal in every at-bat is to get a hit and get on base, but that if opposing pitchers want to put him there themselves, he’ll gladly take the free pass.